Living in the city certainly has its advantages—our neighborhood has a couple of great community parks and many of our favorite restaurants are within walking distance. One of the downsides of city life is having limited personal outdoor space. After spending the last decade and a half living in apartments without any deck or balcony whatsoever, Robert and I finally have our very own sliver of outdoor space. It’s not much, but I’m thrilled about it! This summer, I plan on doing many of the things that people with large yards do…just on a much smaller scale. Relaxing outdoors with a book and a margarita—yes! Planting my very own herb and tomato garden—already done! Grilling all manner of delicious foods—absolutely! Sure, you can “grill” indoors using a grill pan or a broiler, but it’s not the same and usually results in a smoke-filled apartment. It’s difficult to enjoy dinner when you are coughing and fighting with the smoke detector. Now that I finally had my own mini deck, I needed to find a grill to fit it. As much as I’d love to have a big, swanky grill, that just wasn’t realistic. Small and efficient was the goal here. I decided to go with the O-Grill 3000 Portable Gas Barbecue Grill. This grill is great—completely portable, easy to set up and it comes in cute colors too! At 225 square inches, the grilling surface is surprisingly large for a portable grill. The O-Grill turns on in seconds and is fully heated in five to ten minutes. It couldn’t be easier! I decided to give my new O-Grill a whirl for Robert’s birthday dinner. I chose something I knew would work well—mackerel. Mackerel is a delicious, flavorful fish that works magically on the grill. It is so oily that perfect grill marks are pretty much guaranteed. I threw a couple of fillets on my hot O-Grill, and they immediately started sizzling and smoking furiously. It smelled amazing. A few minutes later, I had some beautifully crisp and moist mackerel fillets. I served them over Sicilian-style pasta with fennel, currants and pine nuts. Since then, I’ve had success making grilled zucchini (a personal favorite), grilled lemongrass shrimp with Vietnamese rice noodle salad, and beef sliders which we topped with kimchi and fried eggs! For my birthday, Robert and I decided to celebrate by grilling some fresh trout. We kept things simple, filling the fish with lemon slices and a little rosemary (freshly harvested from my very own outdoor space!). 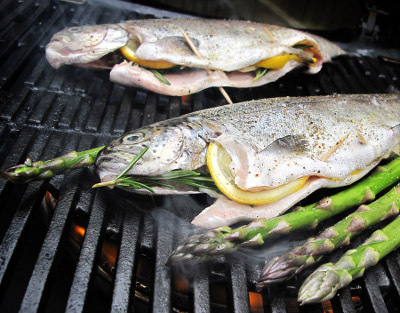 We grilled the trout along with some beautiful Alm Hill Garden’s asparagus. The trout ended up being perfectly cooked—moist and tender with grill marks rivaling those of the mackerel. Another perfect birthday meal! The O-grill might not seem like a serious grill, but compromise is another part of city life and so far I am quite happy with the results. I’m looking forward to grilling many things this summer. Corn, pizza, fruit—the possibilities are endless. What’s your favorite thing to grill?